Ben & Jerry's is once again celebrating another year of successful ice-cream peddling with Free Cone Day on April 29 (today). 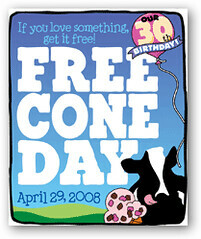 You can go to any participating Ben & Jerry's scoop shop and get a free scoop of your favorite ice cream flavor. There are over 400 Ben & Jerry's stores in the US. The Scoop Shop locator can help you find a participating store. Just pick the state you live in and check the "participate in Free Cone Day" box. Be sure to get in line early so you don't have to brave the invariably tortuous lines.